A funny variation of the crashed tree trunk witch! Familiar classic character Wizard of Oz-inspired Red Shoes adds just the right whimsical touch to your Halloween decor. 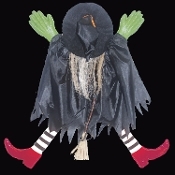 Why not add this comical Wicked Witch decoration to your front door, entry wall or yard tree for neighborhood fun and laughs! Complete your outdoor Halloween scene display with the Tree Trunk Halloween Witch. Approx 2 feet (60cm) Diameter. This Halloween prop features a hollow molded plastic witch with red shoes, poly fabric cape and hat, plastered against a tree in your yard. This classic witch decoration is fun for decorating the exterior of your home haunt before welcoming trick or treaters or party guests this year. *For more dimension, you can cut the inside of the hat and fill it with plastic grocery bags or poly stuffing. PLASTIC hollow molded arms and legs, connected to POLYESTER FABRIC BODY with metal bradly tacks. Size: Approx 24-inch (60cm) Diameter x 1-inch (2.5cm) Thick.